to send your story Do you have a favourite memory of being at or playing for St. Peter’s? With a history as long and rich as ours… the characters we all know … and have known … it’s got to be worth sharing.Email your story to the club.Can you remember your first/ last game for the club? Were you at the 16 – 14 Cardiff game? Did you watch the final Grand Slam game in 1995 against Ireland at the new club house? Did you train with Warren Gatland? Were you an invincible youth player? Did you play against the Wak Waks? How old were you when you wore the emerald and black for the first time? Have you got a tour story? No forget that one. Click the player to email your favourite memory. Let’s all have a laugh – or cry at the memories we all share. If you don’t send an email yourself, let the rest of the members know about the page. We are now over 120 years old.. Let’s get something to remember. Go on -give it a whirl. However long or short. If its your memory – it’s our memory! Back row: 1. Not known; 2. Frank Johnston; 3. Billy Reardon; 4. Peter Godwin; 5. Norman Harris; 6. Dennis Norman; 7. Not known; 8. Dennis Young (?) 9. Norman Thomas; 10. Jim Sweeney; 11. Eddie Simmonds; 12. Malcolm Thomas. Middle row: 1. Jerry Thomas; 2. Malcolm Thomas; 3. Terry Corcoran; 4. Frank Maria; 5.Ted Reavy; 6, Pat Doyle; 7. Not known; 8. Pat Dacey; 9. Bernard Sheilds; 10 Mario Carpanini; 11. Billy Callaghan; 12 Ken Waite; 13. John Massey. Front row: 1. Albert Taylor; 2. John Twomey; 3. Malcolm Thomas’s wife (Betty); 4. Not known; 5. Bernadette Nolan; 6. Eileen Johnston; 7. Mary McClancy; 8. Peter Nolan; 9. Johnny Aldermann. There were three tours to Ireland on the bounce and I reckon this was 1954 which my Dad “led”. My parents were not married at the time and so this would have been the only way they could have got away with going away together. You can see the old Mansion House on Richmond Road in the background and this was the first time ladies were invited. They sailed from Swansea to Cork and travelled third-class so I can only wonder how bad that must have been. They stayed at Old Moore’s Hotel in Cork and the women roomed together. My mum told me that the ladies complained to him that they had no wardrobes or mirrors in their rooms. He asked them what they wanted either for? Dad’s room had been recently occupied by a former resident who had died in his bed and the deceased suit and belongings were stretched out on the bed and had to be taken down to reception. They arrived on Good Friday and so all the pubs were closed. The old man had a load of stick over this and was sent out to find a pub that was “open.” He knocked on the first one he came across in Cork City. The bolts were drawn back and a large policemen asked what he wanted. Dad explained their predicament and the copper said “You’d better come in and have a drink while you’re waiting”. They played Sundays Wells on the Saturday whom they beat and I believe that Dennis Norman and Pat Dacey were youth players who made their senior debut. Just before Dad died I went to Cork and took some pictures of Old Moore’s Hotel which was closed for redevelopment at the time. I brought the pictures home and that’s when I heard the story. This was also the tour where Ted Reavy decided to hire a car and show off his beloved Ireland to some of his chums. Ted used to be a test driver for Aston Martin and despite his failing vision swooped along the country lanes in Toad of Toad Hall style at breakneck speed. I know Dad was in the car with him and I think Ken Waite was too. They survived but when Ted handed the car back to the garage the guy asked him where the bonnet was. Thinking on his feet Ted apparently replied “It didn’t have a bonnet when we hired it.” Not sure of the outcome but a true story. There were three tours to Ireland after the War. 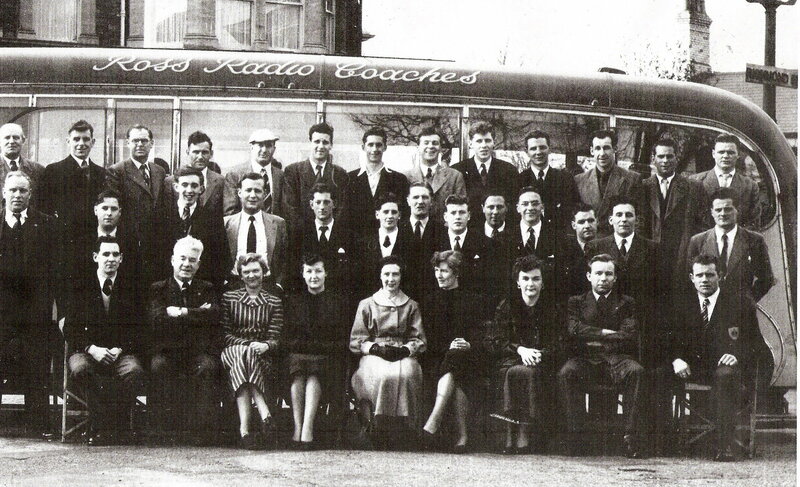 The First Tour was by the Youth in 1953 and the youth went the following year after this pohoto in 1955, staying at a variety of accommodation including Old Moore’s Hotel and Leigh View Hotel. In Old Moore’s, on Good Friday, there was a hatch. When you put your money through the hatch, they gave you a pint of Guinness. Pentyrch V St.Peter’s 1982 Scrum on half way line….. Push over try! Dennis McCarthy and Billy O’Keefe had a smile on their faces for weeks. Many years ago I was playing scrum half against Whitchurch 2nds away with one of their committee reffing (a big fat feller). The 10 yard law at the line out had just come in and the first line out in our 25 the Ref. pulled me for being inside the 10 yards. Dennis Norman was captain playing in the center. Dennis ran in and said to the ref “he’s scrum half ref”. The ref replied”Is he! then you’ll do” and gave the kick smack in front which they duly obliged by slotting it over. I went away with the fourths in about 1990 to Westbury on Severn. The game was an annual fixture and there was always a stop-on on the way home so quite a few of the boys tried to get dropped to the fourths to go on that one. I was picked at outside half that day and it was a lovely September day. I kicked off to start the match – a beauty. The ball was up in the air for ages. Peter Sutton, Lawrence O’Brien, Jo Sweeney etc. went flying into the Westbury pack and floored the lot. There were English bodies everywhere. ‘A cracking start to the game’ I thought. The referee – another Englishman I believe – gave a shrill blast on his acme thunderer and called the Rocks pack to order. So we started again. Played to the laws of the game occasionally and beat them about 80 odd nil. I remember, it would have been back in the early 80′s, I had broken my wrist in pre-season training and missed the trials and the first 4-5 weeks, I was selected for the fourths or fifths and we were playing in the back of beyond on a little pitch and had to change in a little tin shack. Because it was so cramped a couple of us retreated to the showers to change, I was going through a stretch routine when I heard our boys doing the old 1-10 warm up, feeling guilty i went in to the changing room and apologised to Eugene who was the captain,”Sorry, Eug” says I.”S’okay Crock” says he, ”do you want to take us through another one.”OK” says I thinking, ‘I didn’t know they were so keen at this level!By the time i got to 3 they had all sat back down clattering their boots on the concrete floor, and bending their little fingers back and forth and led by Eug all smiling smugly as i was going at it like a lunatic. How the mighty had fallen!! I have many great memories of playing for the Rocks over the years however the one thing that sticks in my mind more than anything else is packing down in the scrum behind Rob Ringwood and seeing the pain on the faces of the opposition hookers and props as Rob did his business.What a superb player Robert was and a true unsung hero of a successful side at that time. Time appears to have done for the exact date or, indeed, the final scoreline, but in the early 90′s another unsung hero, Sean Murphy, shone like a beacon in an extremely tight game against the forward might of Llanharan, at the Harlequins Ground.The normal suspects, Llanharan, Rumney and St.Peters, were all in the running for the East District title (pre-national leagues). Llanharan arrived at the Harlequins with their usual monster pack directed, at Number 8, by the great Trevor Worgan. All of Llanharan’s moves stemmed from his ability to involve two or more opposition players in making the tackle on him. He would then flip the ball to one of his supporting runners and the gain line would be breached.In a game where we must have defended in our own half for about 80% of the time, Sean Murphy, single handedly, tackled Worgan on, or behind, the gainline, allowing the rest of the team to do the same to the support runners. From memory, St. Peters managed no more than half a dozen sortees into opposition territory but returned with points each time.It appears that, sometimes, defence does win matches! We had been involved in a very, very tense and tough match at the Harlequins. Due to my advancing years, I cannot, for the life of me, remember who we were playing or the date, but suffice to say it was a big league match and the scores were very close going into the final quarter. We were behind by a couple of points but were attacking in wave after wave setting up position after position for Andrew Edwards (Basher), our talented outside, half to attempt several drop kicks at goal to secure a win. After what seemed a dozen attempts, he did not get one but we finally got a penalty to win the game.The changing room after the game was devoid of the usual post match banter and celebration, in fact, the silence was only punctuated by the heavy panting of the players.No one said a word for what seemed like an age before Brendan Walsh, a great centre but, normally, one of the quietest players piped up “Hey Basher, don’t try any more drop goals will you.”The roused Basher immediately responded, indignantly ” Why not, Brendan?””Because you’re going to have someone’s eye out!” came the reply.A masterclass in comic timing. During the Autumn Internationals 2008, I saw the Murphs at the South Africa game down the club – all 46 of the brothers stood in a circle not talking to each other. A perfect opportunity I thought. I went over and stood beneath them. I didn’t realise how tall they all were until I was up close. My moment with the Murphs was at an end. They had spoken. They returned to standing and not talking to each other for the rest of the evening. January the 16th 1993 – 20 years ago. Having struggled through 4 away games in the prestigious Swalec Cup, our dream came true when the draw for the 5th round came out – Cardiff RFC. The self-proclaimed best club in the rugby world. With their magnificent central ground and club house, it was a fantastic opportunity for players of a lesser quality to set foot on the hallowed turf of Cardiff Arms Park. To follow the footsteps of Bleddyn Williams, Barry John and Gareth Edwards to name a few. We would have the chance of playing a competitive game against Cardiff RFC – where the whole country would be able to read about your efforts. So how could you win ’000 – 00′, I here you ask? Well that is where the game turned for the home side. St. Peter’s RFC, a local parish side, steeped in the history of the Cardiff and District Saturday afternoon slogs, against the likes of the Buns, the Ilts, Rumney and the Joes were now to face the might of Cardiff RFC, and the elite of welsh rugby. It’s the stuff of dreams the rugby equivalent of Roy of the Rovers. Of course we will turn up, play the game, be proud of taking on some welsh internationals, look forward to a quick chat after the game, sitting eating and drinking their after game hospitality. What more can the boys ask for? After all we did deserve to be there – having beaten some quality village sides on the way. Narbeth – a particular gem of a game, down in West Wales. The Mighty Farmers against the City Catholics. Only one winner you would think. But hey, we turned them over in their own back yard, battered and bruised, but worth every knock. Our coach was an old stalwart. LOB they called him. Ha. Ha LOBs BARMY ARMY they started to call us. A couple of weeks nearer and there was still hardly any press interest. But then why should there be? Cardiff, Neath, Swansea, Llanelli. All battling out on top of the Premier League whereas St. Peter’s (The Rocks) were in the bottom 4 of the 3rd division. Yes we had a plan and some help from an ex Cardiff player, A fall out with the great Australian coach, Alex Evans saw him leave Cardiff for the dizzy heights of Pontypool to join his big mate The Bish, in a dazzling half-back partnership. So cometh the day, we meet at the clubhouse, a mile and a half from the centre of Cardiff, and the hallowed turf of the Cardiff Arms Park. A double decker 1970′s bus to take us and our close support to the ground. And then eventually… the walk down the tunnel. Tape and strapped ready for battle. Don’t get me wrong – we were up for it to a man. Every one of us, veins pumping – the Blue and Blacks would be in a game for sure – this is not just a another run out. No no – we would give them a game and they would remember our name. THE ROCKS! At least for giving 100% to a man… and hopefully keep the score to a minimum. And so we walked out onto the pitch. Hey quite an atmosphere. What 5 maybe 6 thousand croud. A hell of a lot more than that of our home ground. The Harlequins Playing Fields, and our rotten changing rooms with the paint falling off the walls – maybe a few Coffin Dodgers on the Bob Bank and 50 or so supporters along the line. I Remember the focus though. I have never seen it before in this team or any team. Is there a real belief? – well yes. But not a win… surely? I mean don’t get me wrong, it’s not completely impossible – is it ? Yet looking around the ground as we huddled in the middle it felt like home. Our colours emerald-green and black seemed to cover the terraces. Did I spot some painted faces? Even a Mohican or 2. Just great to see. But what was that? What are they pointing at? We look – but don’t understand. We cannot have any distractions now but… they keep pointing and screaming – what is it??? BOYS they shout BOYS – LOOK AT THE SCOREBOARD! is the cry.- LOOK AT THE SCOREBOARD! And there it is – the scoreboard !!! Then – Now – Always!